In the customizer, go to HERO -> Front Page Hero. 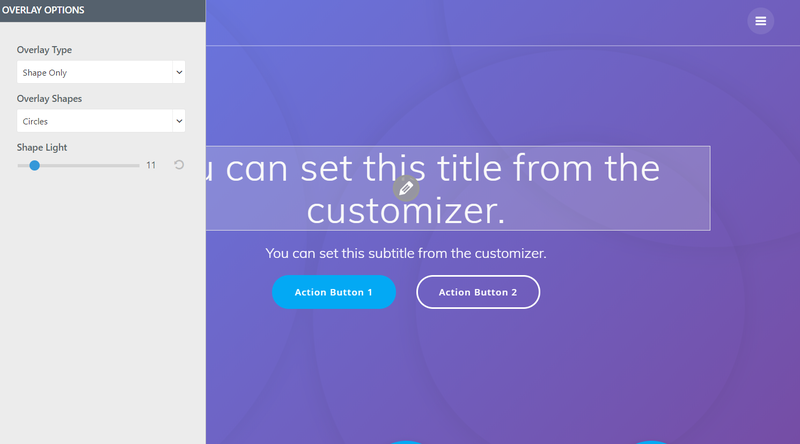 In this section, you are presented with a wide range of possibilities to customize the front page hero image and text. Depending on the background type you choose, there are further options to adjust the appearance and layout of the front page hero. Click on Options and set the color of the background hero, as you want. 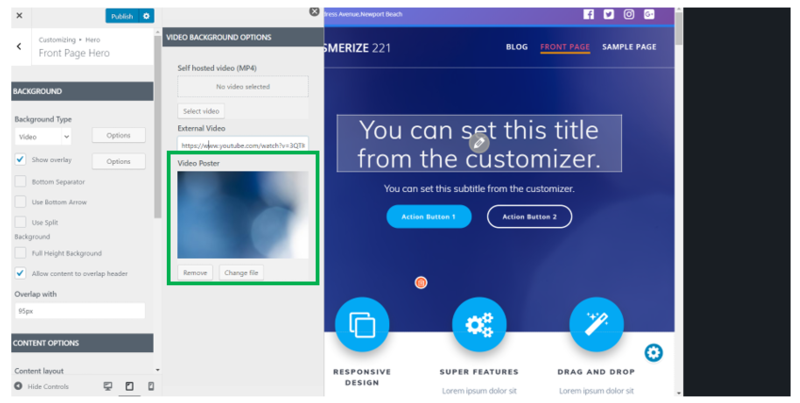 Click on Options and upload an image of your choice, to set as background hero to the front page of your website. 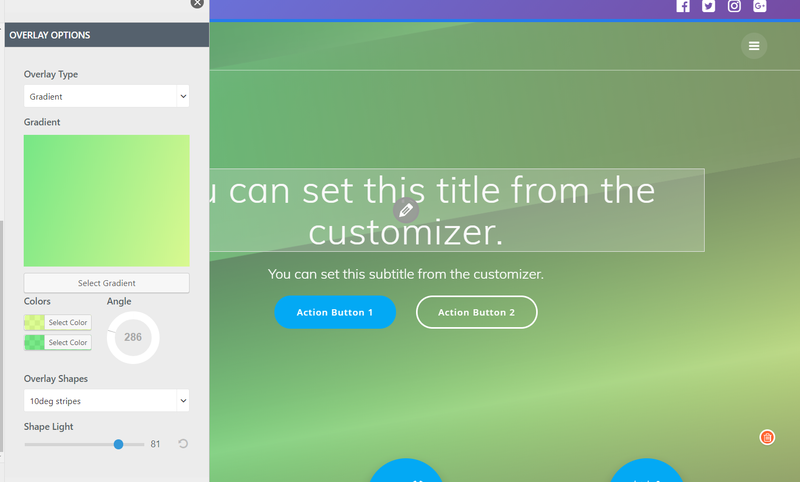 Background color – you can also select a color for the header background. Enable parallax effect (A parallax effect consists of a slightly hidden background that stays in place, and as the foreground moves, you continue seeing the still background until the entire foreground is covering it). Check the checkbox to enable the parallax effect. Mobile Background Vertical Offset: it refers to the vertical distance by which the background image is out of line. Adjust it to the values that are convenient for your website when it is displayed on mobile. This feature allows you to set a video as hero background file for the front page. 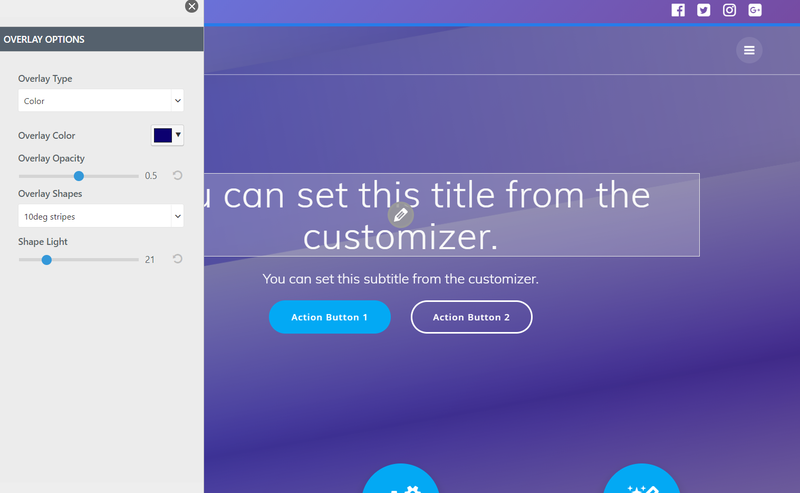 Click on Options to open the customization panel. You may want to simply apply a gradient to your front page hero background, and do without images/videos. Setting a uniform color is not your preferred option, so you can select a gradient. For setting up a gradient for the background, open the panel from which you can choose/change the gradient to one of your own choice. 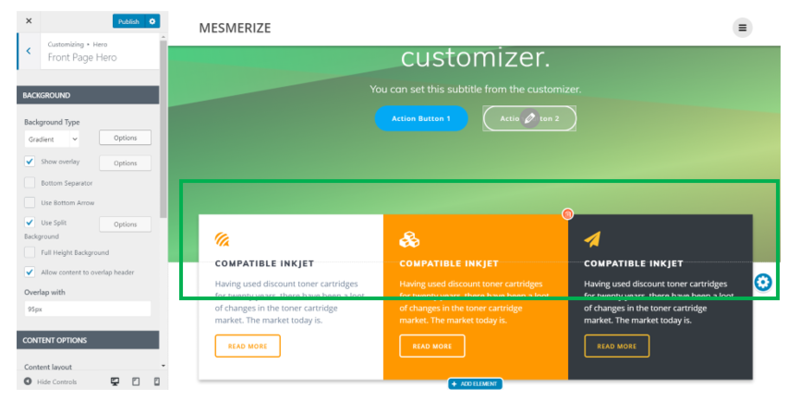 Use Bottom Arrow – the bottom arrow is a graphic element used to inform the user that there is more content below the header. When the user clicks it, it will scroll the page to the area below the header. This element is usually used when you have a full height header. Icon Background Color (you can change the background color of the icon). Full Height Background – the background can be set to full height, so it occupies the entire space dedicated to the front page hero image/background. The changes are more visible on mobile devices. 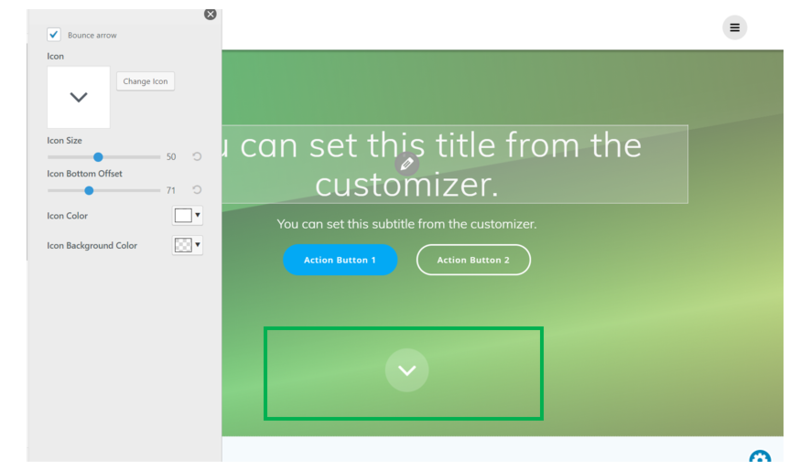 Allow content to overlap header – when content overlaps the header, a certain part of the content section is indented into the header. You can activate this option or leave the checkbox unchecked (if you do not want the content to overlap the header). Overlap with: from here, set the values for the distance at which the content section is indented into the background. The overlappable sections are the first you will see in the list of available content sections.